Transit riders help the region win so we thanked them! 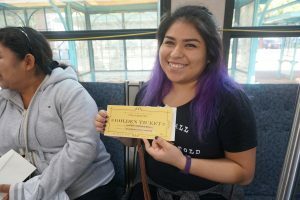 What started off as a normal day on transit for hundreds of central Puget Sound residents quickly transformed into a massive prize giveaway, with hundreds of winners. 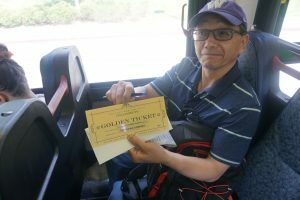 On buses, trains, and water taxis throughout the Seattle area, transit agency staff and volunteers surprised riders by handing out prizes ranging from coffee gift cards to airline tickets. 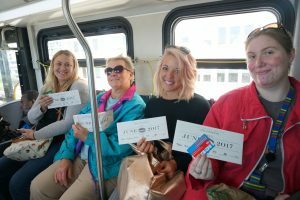 The event, Transit For The Win, took place as part of the annual Ride Transit Month celebration. Challenge Seattle, a group comprised of the CEOs of some of our region’s top employers, provided the prizes as a way to delight and thank transit riders for the role they play in keeping our economy moving. 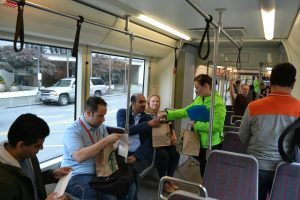 “Challenge Seattle companies are proud to support this effort to highlight how critical high transit ridership is to easing congestion and improving our region’s quality of life,” said Challenge Seattle’s CEO, former governor Christine Gregoire. Our region is rapidly growing. Seattle is currently the fastest growing big city in the U.S. while Pierce and Snohomish counties are the two fastest growing counties. Downtown Seattle alone added 45,000 jobs in the last six years. Yet Commute Seattle’s modesplit survey shows that only 2,255 downtown peak-hour car commutes were added during this same time, with transit absorbing the majority of new commuters. By choosing transit, commuters are not only saving space on our limited roadways, they’re also helping save the environment. “We support this celebration because providing a variety of options—including incentives to bike or take transit to work—is key to meeting the needs of our employees, while also cutting carbon and congestion,” said Sue Desmond-Hellmann, CEO of the Bill & Melinda Gates Foundation. 65% of transit boardings in King County are made by riders with subsidized ORCA cards provided by businesses and institutions. These benefits, coupled with recently expanded light rail and bus service, have made the Seattle area the national leader in transit ridership growth, representing a return on investment for choices that Seattle voters, businesses and agencies have made in recent years. County Metro’s bus, Rapid Ride Lines, and water taxi, and the Seattle Streetcar.